A recent article in Mobile Marketing Watch discussed survey by Knowledge Networks, a research firm, revealing that 86% of iPad users would watch ads for free TV programming or quality magazine content. When I discuss mobile magazines with mobile or advertising industry professionals, they generally aren’t impressed with digital magazine experiences. That made me think about how mobile design could improve the advertising experience innovating iPad magazine ads and content. How many times have you seen a magazine on an iPad and felt the publisher did little more than produce a slideshow with simple navigation? In many cases the mobile ads, as well as the publication’s content, looks like PDF copies of the print version. I think publishers are on the right track in modeling layout of a digital magazine based on its print counterpart. But improvement is needed. The mobile user interface design of an iPad could take a lot of inspiration from layout but the familiarity should stop there. Once you get to the actual features or experience, I recommend looking at what’s working best in your website instead of your print publications. How about taking the best interactive features of your site and making it easier to use? Improve the mobile user experience. Create a friendlier user interface ensuring the magazine is easy to consume. Including social media features would also improve user experience. Let viewers share articles, excerpts and photos on social networks. Create engagement and conversation with user comments. One of the reasons for low click-through rates online is due to dull advertising. What about taking best of breed online ads like integrating homescreen takeovers and trying them in digital magazines? What if publishers and advertisers produced better interactive ad units using IAB standards? How about serving intelligent ads based on former ads the user has engaged with in your publication? 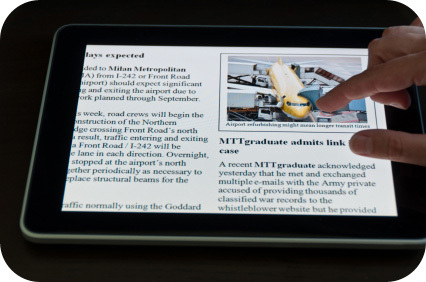 Recently, the Wall Street Journal’s iPad app introduced an inline video on the front page and sprinkled elsewhere throughout the publication. CNN now has a gorgeous, very attractive layout with scrolling horizontal article teasers (photos and text) and vertical rich mobile ad design columns on the home page. It’s like a kaleidoscope of international, national, entertainment, technical and other news that keeps readers’ eyes glued to each page. Mobile ads are designed carefully blended with news content. Creative advertisers and brands could even experiment with virtual currencies to reward readers for watching ads and sharing information. They could give points for “unlocking” and viewing ads, for example, while varying the number of earned points. By employing game mechanics you create deeper engagement that encourages readers to earn more points for additional magazine content. As a result, advertiser and publisher creativity would improve, exposing readers to superior innovative media.